Being a resident of central Virginia enables me the opportunity to be a frequent visitor to annual festivities at Trail Days in Damascus. The event always occurs the week after Mother’s Day and is generally a weeklong celebration of backpackers hiking the Appalachian Trail (AT). Damascus is widely regarded as the “friendliest town on the trail”, a product no doubt of a marketing campaign many years ago to advertise a town that had only 981 people according to the 2000 census. It has been my experience that this moniker is well deserved as quite literally every townsfolk I’ve ever met in Damascus have been nothing short of kind, generous, helpful and good-spirited. An event of this type at this time is intentional as a good bulk of hikers stomping their way from Georgia to Maine are frequently in the area. By this time, hikers are well into their journey, some have already dropped out, and many are already fairly skinny and sporting impressive beards. Men too. Consequently, Damascus is also the central point of four scenic trails converging – the Appalachian Trail, the Virginia Creeper Trail, the Iron Mountain Trail, and the U.S. Bicycle Route 76 “trail”. Each year the town hosts approximately 20,000 tourists during Trail Days making it the largest single gathering of AT hikers anywhere…most of whom make a combined appearance on Saturday for the peak of the festivities (and tourists). This year was the 75th anniversary since the official recognized completion date of the AT. Unfortunately, based on the lack of attention to this fact, I’m not sure it was widely known. Shame. Compared to past years, this year was a bit of a disappointment for me because fewer and fewer lightweight manufactures have been making an appearance. For the first time in recent memory, even Six Moon Designs was absence…course I give them a free pass anyway since they drive a van from OREGON! Gossamer Gear hasn’t been at Trail Days for many years, but again they would have a long journey (Texas). Backpackinglight has been a no-show for many years, but then again their product has become so diluted and irrelevant over the last two years that an appearance likely wouldn’t mean a lot to anyone other than those who are still running on the vapors of nostalgia and what once was a very thriving and wonderfully industry-leading company. Zpacks (Florida) also wasn’t there, but I’m not sure Joe has ever attended. Skywalker gave a talk on a new book he had written. For an articulate guy who has not choice at 6'11" to stand out, he got a lot more attention with the dozen or so tugs on his crotch while he was talking. So who carried the torch for the lightweight industry? Ron Bell from Mountain Laurel Designs (a Virginia company) had his tent set up with several shelters and packs. He was even generous enough to give out some freebies to certain folks (UL ground cloth and MLD sticker). I regret to say that I didn’t see a lot of traffic under his tent despite his top notch and industry-leading quality products. I think this is due to the fact that lightweight backpacking in the sense of a manufacturer like MLD still isn’t mainstream and items made of cuben or packs without frames are still relevant only to a minority. Mark St. Pierre from Hyperlite Mountain Gear and his team also made an appearance with their shelters and packs. He had made the trek from Maine and personally I wouldn’t have minded making the trip back with him as I’ve always had a hankering to spend a bit of time in northern New England. I’m still trying to wrap my mind around Mark and his company. He was a chef who one day decided to get into the backpacking business and his company seemed to have come out of nowhere virtually overnight. While this is not all that uncommon, his business model and products are like the Apple of backpacking in that his marketing, spin and business savvy is surpassed only by the quality of his products. How he went from unknown to top tier is beyond me…but he does make good stuff and he can definitely walk-the-walk. There were a variety of other manufactures too: Elemental Horizons, Lightheart Gear, Jacks R Better, NEMO, Enertia Trail Foods (now under the Coleman brand at Walmart), Appy Trails, Yama (new high-end quality company finally selling shelters whom I interviewed nearly two years ago), Outdoor Research, Black Diamond (lots of people needed their BD poles repaired…which makes me happy I don’t carry their product even though they have a good following), etc. I was surprised to not see Brian MacMillen from Outdoor Equipment Supplier (OES) as he is always good to talk to if nothing more than to be impressed with what he’s done in his young career. One thing that struck me quite resoundingly was the significant increase to hammock manufacturers and products related to hammocking. It would be impossible to miss a definitive and growing trend in this industry. From a bird’s eye view, I would argue that if I were going to guess where the next “big thing” in the outdoor industry will be, I’d say it would be in hammocks. Things seem to be moving quickly towards lighter and more affordable. In attendance were Hennessy Hammocks, Hammock Gear, DutchWare, Dream-Hammocks, Eagles Nest Outfitters, etc. I was surprised that Brandon Waddy from Warbonnet Outdoors wasn’t there to defend an industry which he took by storm in the last couple years. Most of these tents had constant visitors and from my conversations and fondling of hammock gear I can say with honesty that many things impressed me enough to really take hammocking far more seriously. If you have the opportunity to visit Virginia during Trail Days, give it a shot. It’s always nice to be around people of common interest. And that was my introduction to Trail Tested, a new book by Justin Lichter ($20). First and foremost, and I’ve definitely never said this about a book, but man…this thing is gorgeous! Lichter (Trauma) obviously invested a lot of time and energy on the aesthetics of his first book. Great layout and design, tons of pictures, full color, very nice fonts and graphics, ….just wow. So why care about another backpacking book. Well for starters, Lichter has hiked over 35,000 in just the last 10 years. He even hiked the Triple Crown (AT, PCT, CDT)…around 10,000…in one single year. Impressive. He also never seemed to be someone who pushed the obsessive boundaries of lightweight backpacking. Simply, he wanted to go as lightweight as possible, but with functional and comfortable gear. With his mainstream pack being one from Granite Gear, that’s really of no surprise. Lichter’s book is a how-to manual for new backpackers and I’d argue for someone looking to work at REI. He covers a lot of very valid, but fairly well known points. Course, I personally gathered this knowledge from a multitude of sources over a long period of time and I suspect that having it all in one place will have a solid following. There are very few stories as he focuses mainly on how to use gear or types of gear and the benefit of using one type of gear over another, versus specific manufacturers of gear or his preference towards particular models. He answers a lot of questions about the AT, PCT, CDT, Hayduke and even backpacking in Africa. If you’re new to backpacking, looking to work in the backpacking industry perhaps at a retailer like REI, if you enjoy looking at great photos of outdoor scenes, or if you’re inspired to financially support a fellow backpacker successfully avoiding a desk job, consider buying this book! Another wonderfully righteous dude who doesn’t get enough air time on my blog is Ben from Goosefeet. Ben jumped on the scene a few years ago with a product I had been looking for over the years and never liked what the market offered – down booties. Ben’s, unlike others, was the exact minimum I wanted for backpacking – down + lightweight fabric and nothing more. I didn’t need a lug sole, heavy duty fabrics, or any other bells and whistles – just something to keep my feet warm. I was one of his first customers and I still use them regularly. In fact, he is making a pair for my wife right now. 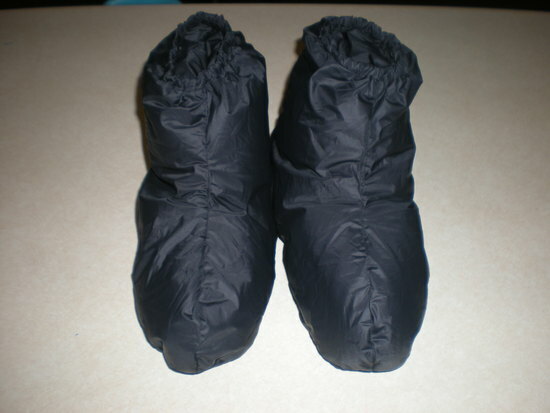 There is nothing I’d rather have on my feet in the backcountry while sleeping than his down booties which offers more warmth for minimal weight. Ben reminds me a lot of Brian over at Outdoor Equipment Supplier. Both take their business very seriously, treat their customers extremely well, are willing to do custom work, and offer top notch products. Consequently, both are Undergrads or Grad students in Engineering. I’ve learned to value the opinion of both as each offers tremendous insight and can make nearly anything you dream of come to reality. Ben has been kind enough to be my sounding board for a few projects and ultimately put together items that no one offered. For example, a cuben jacket (vest + removable sleeves). There is nothing I own which offers a better warmth to weight ratio and is as tremendously flexible. He has also been my go-to guy to repair gear where other cottage vendors had fallen short or didn’t quite do the same kind of competent job he does. 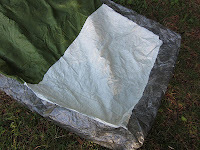 The latest project he took on for me was a cuben hybrid bivy. 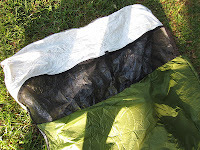 A bivy is a sack that goes over a bag or quilt. 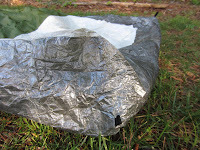 The intent is to protect the bag/quilt from moisture, but it also adds a few degrees of warmth and can offer mosquito protection. 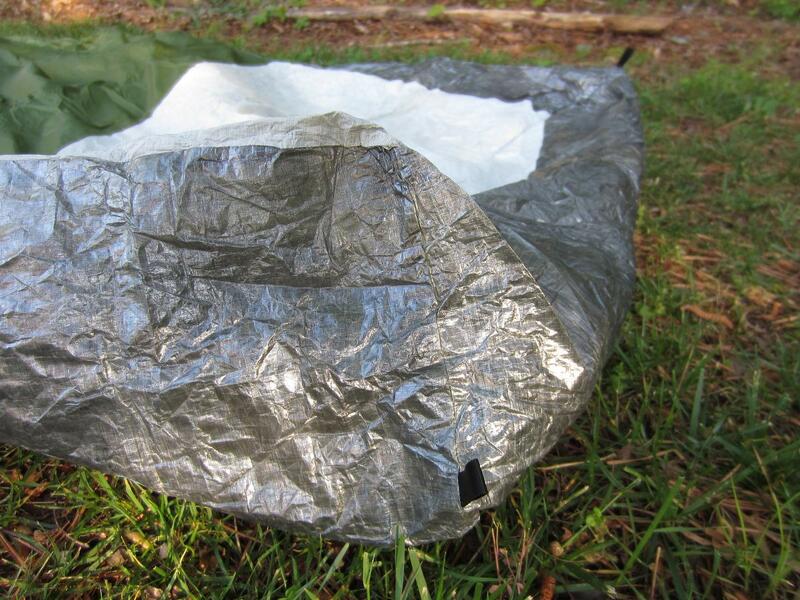 It is ideal for tarps and also good for groundless shelters or shelters like the Zpacks Hexamid where the ground material is mosquito netting. 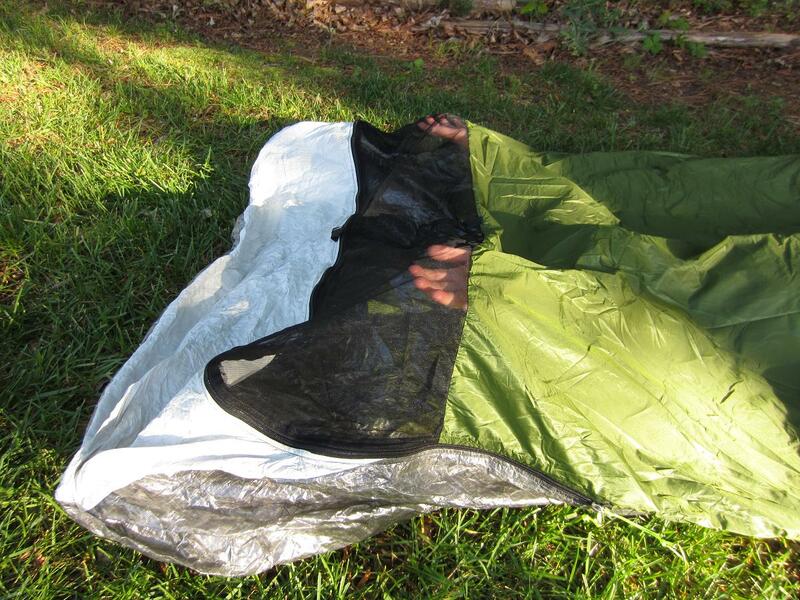 For those people who use bivy’s, they love them. Most people shy away from them though because they don’t understand them. 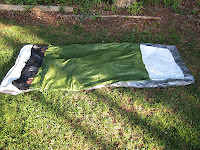 A bivy to me part of my sleep system and a direct result of my growing understanding of lightweight backpacking and how to best take care of my gear. It offers me the most flexibility and greatest protection for my down quilt which I must keep dry if I want to have a successful trip. The bivy’s I’ve owned in the past have all been made of various silnylon or Pertex products and have been fine, but they were all fairly snug. At 6’5” and 285 with a 54” chest, I’m not your average fit. Knowing I’d be making one bigger than average, I didn’t want that to impact weight and I also wanted to make mine more durable than sylnylon. So, we agreed to make the bottom of waterproof 1.0 cuben with a 6.5” bathtub floor, the head and foot end of breathable waterproof cuben sold by Zpacks, and we used green Pertex Quantum on the top which is wonderfully soft, highly water resistant, and lightweight. It has a 3/4 zipper which goes over my head so that I can fold down mosquito netting over my face if I wanted to. All four corners have a tie-out as does the face. It weighs slightly over 7 oz and is significantly bigger than my other bivy’s for only 1-2 ounces more. And the best part, and the whole point to the endeavor, it fits me. I'm confident in saying that the same kind of bivy for an "average-sized" person would likely be in the 5 oz range. Ben has been, and continues to be, great to work with. He’s a one-man shop which great capabilities and a real understanding of being good to deal with. I highly recommend him for any unique projects you have in mind. I enjoy reading books about backpacking. Whether they are about experiences or technique, and as long as the material isn’t something I’ve heard a couple dozen times already, usually I buy it. I think in a simple way, I enjoy sharing experiences that I likely may never experience on my own. I first heard of Lawton "Disco" Grinter when I stumbled across The Walkumentary a few years ago It’s a great movie on hiking the Continental Divide Trail (DVD). I think one of the things that drew me to the movie was the fact that it was well organized and didn’t come off as a bunch of spliced together still photos or bad videography when in reality it probably contained both. It was just more polished than others who made similar efforts. I watch this video at least annually principally because I like the personalities, photography and personally think it’s the best backpacking video on the market. It also motivates me to hit the trail. For those you haven’t seen it, I strongly encourage you to take a look. After all – it’s free for download or a mere $5 for purchase. After watching The Walkumentary, I reached out to Lawton to answer a question that I honestly didn’t really care about but was intrigued about at the time. Considering all the topics I could have asked, apparently my little mind merely wanted to know if he and his hiking partner (P.O.D. – Princess of Darkness) were romantically involved. I guess I felt like the story was never adequately explained in the video despite sharing a tent, the obvious inside jokes, and the general exchanges that goes along with being a happy couple. Lawton said the answer was that they were dating, and according to the book, they are now married living in Denver with P.O.D. working as a teacher and Lawton as a full-time forester. Lawton graduated with a Masters Degree from Virginia Tech. Being from Virginia and having worked on my own Masters at Virginia Tech (I never finished), I guess I felt a bit of a kindred spirit (and jealousy that he was able to progress in his backpacking and professional career more than I have been able to accomplish). Lawton is also taller than average (he’s 6’2” and I’m 6’5”) and embraced the “lightweight” side of backpacking which is obviously another commonality. As a Triple Crowner, I figured most things he had to say about backpacking were probably worth listening to – that – and he had an honest humor about him. 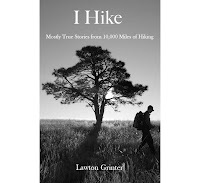 Lawton put what could easily be described as the greatest hits from his backpacking experiences into a new book called “I Hike”. It is available several places. If you want an autographed copy for no additional charge, go to Gossamer Gear. Lawton is a GG Trail Ambassador and carried a minimalist pack on his adventures. You can also get a copy of his book at Amazon.com or Barnes and Nobels. This weekend I read it cover to cover. This should speak highly of the book because I wouldn’t describe myself as a “reader”. Consequently, if whatever I’m reading doesn’t flow well, I normally get distracted from the content and focus instead on composition which makes reading in mass undesired. On Saturday I was supposed to run in my first 5k since tearing my meniscus over a year ago which required surgery, my first run of any kind since this time. Unfortunately, as happens more often than I’d like, my diabetes decided to remind me that I’m on a different playing field than many others and there was no chance I would run (or walk) the race. First, I was up all night Friday with hourly trips to the bathroom pondering how it was possible to pee so much. All of Saturday was spent feeling like I was in a coma where I couldn't simply sleep it off. Saturday night was similar, and Sunday was only a little better. This is what happens when glucose (energy) gets stuck in a body and can’t be processed correctly causing it to be 3 times more, or less, of what it should be in a “normal” person. To me, if feels like a build-up of toxins and my whole body hurts much like the feeling after running a marathon. The act of moving, no matter how small (a walk from the bedroom to the bathroom) is not just challenging, but painful. Needless to say, I was pretty incapacitated and decided to read. Lawton writes very well. According to the book, the grammar was largely a reflection of the influence of his mother, a Librarian. In fact, his grasp of solid writing jumped out at me as I reflected on a youthful generation where broken English thumbed out on an iPhone is becoming all too common and an actual understanding of basic English is slowly evaporating. Just this week I had to explain to a youthful college-degree toting coworker that St. Louis was the destination of a meeting as to clear up her confusion voiced widely in a business e-mail to several where she wondered aloud about the identity of St. Luis, apparently a quite religious Puerto Rican with an exciting nightlife worthy of being visited by business persons. Everything in the book flows nicely and Lawton paints a nice picture. Bill Bryson is a little more illustrative, but I’d say Lawton was on par with Bill “Skywalker” Walker who consequently had a Masters in English and taught it for many years as best I can recall. While Bryson continues to hold the unchallenged top spot in outdoor adventure books when it comes to hiking and related humor, I think Walker and Lawton definitely have something to contribute. Lawton’s book is a collection of stories and observations from his time spent on the CDT, PCT and AT in addition to other shorter journey's. I would argue that there is a lesson in each, whether it be about making smart decisions, recognizing limitations, respecting weather, understanding gear, being moved by the loss of a friend and helping prevent the loss of another, accepting lower mileage days in the face of adversity, the positives and negatives of Trail Magic, the positives and negatives of a good map and technology, etc. These stories cover the real possibility of getting hypothermia or Giardia and the discomfort and variety of bugs and relentless bears. There are several great comical sections of the book which I think Lawton handles with ease. One of my favorites is a story about a Great Blue Heron being struck by a car whose occupants lack of reaction seemed to imply that hitting a 4 foot long rare bird was normal in that area (Lawton was in the backseat merely trying to hitch a ride). Hands down, my favorite character from “I Hike” or “The Walkumentary”, and I trust this is of no surprise to anyone who is familiar, is a German engineer named Speedo. If Lawton valued making money from his writing and videos, I would tell him that he has a virtual cash cow in all things Speedo and should strongly consider a greatest hits version of his escapades, and well, all things Durf and how American soap is not adequate for everything. You’ll need to read the book to understand that reference. So, get the book whether for the enjoyment of the stories, the experience of someone tested, or to support a fellow hiker.